Home / Posts Tagged "Nera River"
Spring is coming: we can already feel in the air new smells and see the first flowers, everything comes back to life, emerging from hibernation. Including us, who have passed the winter moving from a house to another, to a pub, to a cinema: finally we’re going out. Why not to come and see an outdoor sight that starts again? 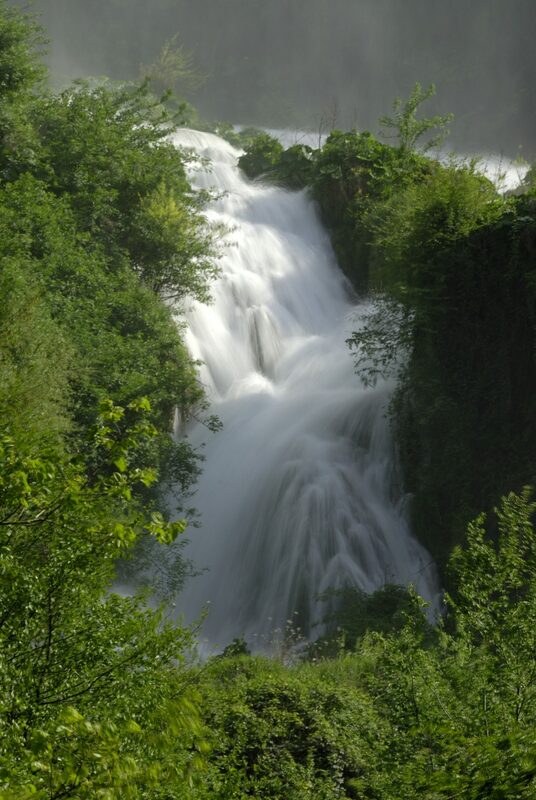 In the heart of Valnerina, Marmore Waterfalls are waiting for us. Maybe not everyone knows that the Waterfall is an engineering project dated back to 290 b.C., when the roman Consul Manio Curio Dentato ordered to dig a channel to make Velino River flow in the valley of Rieti, directing it until the cliff of Marmore, where the waters thrown down and merged into Nera River, throughout a drop of 165 meters. This project was made to reclaim Velino River, which formed a brackish marsh so it was possibly dangerous for the people because of malaria. Today the Fall is used to generate electricity by the powerhouse of Galleto and that’s why the water’s release is controlled;in specific days and moments of the year we can admire it in all its beauty, in particular from March to October, including festivity days in the other months. It’s interesting to discover that the place hots one of Centers of Environmental Education, scattered from there to the valleys of Nera River and Piediluco, areas that fall into the European Ecologic Net Natura 2000 by Project Bioitaly, which is working to promote an eco-sustainable tourism, with the knowledge, the preservation and the promotion of the territory, supprting the development as better as they can. Curiosity: the name Marmore comes from salts of calcium carbonate that settle on the rocks, making them look like marble crystals. What increases magic, besides the enchanting landscape, is the Fall’s pixie Gnefro, who tells the legend of Marmore to the children that will begin the Enchanted Walk with him. But in the park, we can find footpaths that adults can do too: six routes, different for name, for environment and for difficulty. The Ancient Passage links the two entries to the Fall, the Belvedere Inferiore with the Belvedere Superiore and it isn’t so simple to go along, but throughout this way you can go to the Lovers’ Terrace. So put on trekking shoes and let’s go! The Ring of the Nimph is the easier one, it lets us approach to the Fall as possible as it can, because there are small stairs and small wood bridges, and then we can admire one the 300 natural caves scattered in the area. The Meeting of Waters is a way that follows the canyons that Nera River hollowed in the rock until the confluence with Velino River and it is the way used to realize the Enchanted Walk. Furthermore, it’s the best place to see canoeing and rafting lovers who challenge the waters. The Magnificence is the only route that lets us see the three drops that create the Fall, so this way is defined the touristic walk par excellence. There’s a complete vision of the show. The Man and the Cliff is the longest route, which starts from Belvedere Superiore and develops along the edges of Marmore cliff, showing different views like the basin of Terni and the clefts of Ferentillo. With tour guides, we can visit some the most evoking natural caves. Finally, the Wise Holm Oaks, only for experts because it goes from the bottom to the top and vice versa, throughout steeps and disconnected paths, and it’s the unique way that doesn’t allow us to see the Fall, but only the old power station pipes. 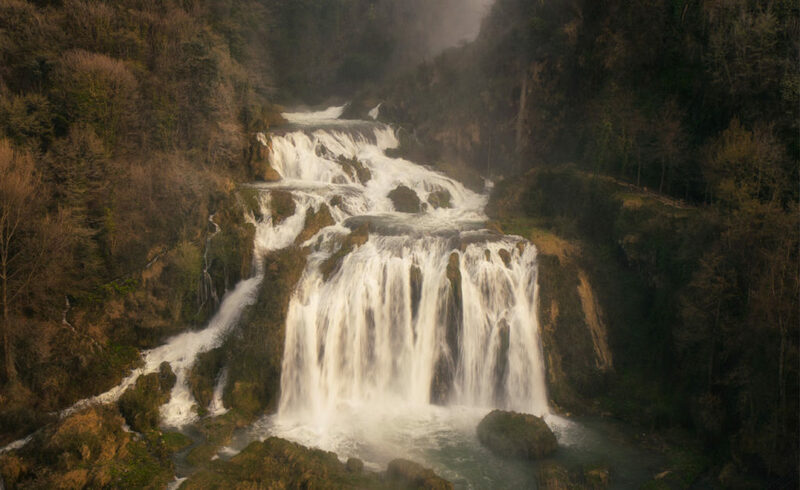 May I tell you when you should go to Marmore Waterfalls? In summer, in the hottest moments. You will be stunned by the microclimate made by the union of the dense nature and the water. Believe in magic…also in Gnefro!